Donna Whiteley and Jan Stuckey have put together a flier and envelopes which they call In Lieu of Flowers. This program is one of Hope whether to help fight for the one you are caring for or fighting for the next one. 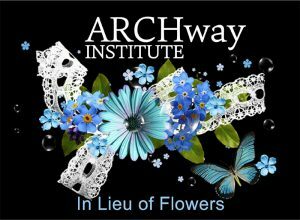 If you know of any funeral home, recovery center, sober living house or other facility which would be willing to display these fliers, please contact Jan Stuckey at jan.stuckey@thearchwayinstitute.org or Donna Whiteley at daw1997@sbcglobal.net They will ship you information and fliers. It is good to have the visibility to the public that this is a disease – and that we all need to come together to fight it.